Ah, the old “About Us” conundrum. To do or not to do? I could tell you that EP is the girl, Brett (AKA Big Blue’s Driver AKA me) is the boy and Big Blue is the bus that is the reason for this site. I could tell you that EP loves wine and wine country (and writes about it here), and I follow the path of music (old vinyl) and books where it leads me. I could tell you that between the tent and the bus we spend at least 35 nights a year in campsites. Sometimes fighting raccoons, sometimes not. I could tell you all that but it’s pretty boring and maybe self-serving. 1. Note Big Blue’s history in a spot that would be easy and fun to access. In doing so, the site has managed to take over my life somewhat. I now try to photograph every VW I see (which is a TON in California). I have considered vacations to certain places based on the amount of VWs I think I may see (Texas? Precious little VW-ness). My closet has been taken over by VW t-shirts, my garage with VW-related junk and most of my email correspondence is in some way vw-camping-related. 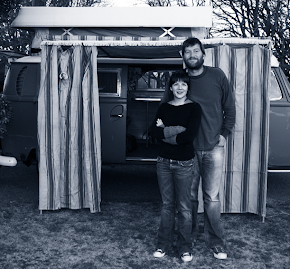 Now, there is a new element to this site - the VW camping community. From Big Blue's annual Bus City campout, to various weekend shows, the Northern California VW community is growing, and we are staying in touch. A giant team! Before moving Big Blue from the storage spot after we bought him, I had read John Muir’s, How to Keep Your Volkswagen Alive. I thought, "crap, this should be easy." For a back-to-nature-self-reliant-grow-it-yourself-type like I consider myself to be, it seemed the perfect car. I could work on it in my spare time! It will be fun! So 1 VW became 2. But we entered the world through the camping door. 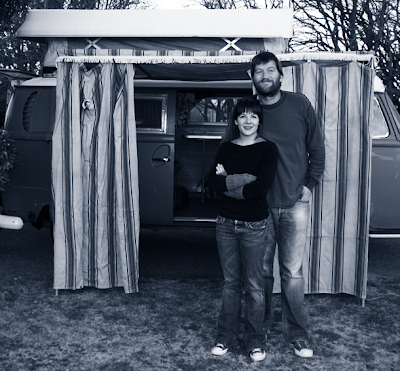 And, while we wouldn't consider any other way of camping than Big Blue, we are by no means VW experts. Sometimes I sit there and scratch my head at the bus and think, "Man, I just want to be camping". I look forward to having a good 15 years experience in Big Blue, then, perhaps I'll know some tricks. So we camp, learn, camp, sleep and camp some more. And have fun all along the journey. As my friend Crazy Al used to say, "it's all part of the expedition". You two look fabulous surrounded by the regala of Big Blue. The tent makes the camping that much more personal and intimate - to think that I didn't even open the tent for the first five years I owned the bus embarrasses me. Keep up the camping!! Christian - Thanks for all the tips! I'd love to come to Texas for a show someday. Glad you found us here. We have had quite a good time in Big Blue - I'm sure you know the feeling! 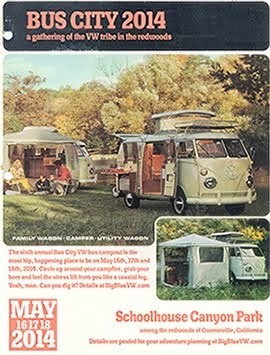 You should consider looking at www.VWCamperFamily.com and see if there are some bus folks in your area. Laura - glad you dig the blog. Hope to see you out on the road sometime!